About two years ago, I had a very interesting conversation with my neighbor who lives in the same apartment building in Zamalek, Cairo. I remembered this conversation today in light of the notorious verdict today by a judge in Minya sentencing 720 people to death. My neighbor is a nice, decent man in his late sixties, and we have always had a cordial relationship with each other, despite me once causing serious damage to his apartment when a water pipe burst in my apartment flooding his just below mine. I was rushing to some demonstration against the ministry of interior to protest against the endemic use of torture in police stations. I had my kufiyya on, and was already waving the Egyptian flag. I ran into him on the landing on the third floor. “I see you are going again to join the Tahrir crowd. Don’t you think it is enough?” he asked half-jokingly. The minute I said this, the guy’s face change, and I immediately realized my mistake. My neighbor is a retired police officer. “Yes, I do remember that incident. What about it?” I replied. “Exactly,” he said. “And do you know how? I’ll tell you how. 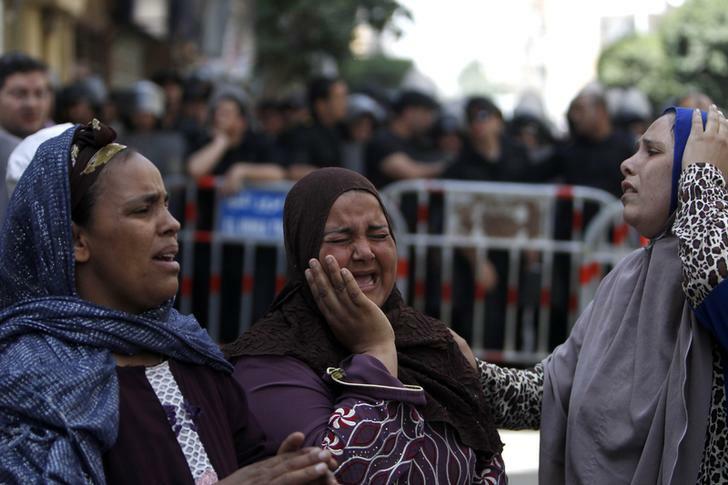 It is through the diligent work of the Egyptian police. Because your brother is a decent man like you, I immediately called some of my colleagues and they sprinted to action in not time, and in a matter of a few hours we managed to identify the culprit. We rounded up some suspects form the street, and encouraged them to confess in the police station,” he said with a twinkle in his eyes. I didn’t want to tell him that I was nearly fifty, and that our disagreement had nothing to do with our respective ages. Off I went to my demonstration, and he went in to his apartment. I remembered this conversation today in light of the notorious verdict issued by a judge in Minya. I know it is tempting to read this verdict as a politicized one; a feature of the ongoing struggle between the military-led government and the Muslim Brotherhood. The judge must have received a phone call ordering him to pass on this bizarre verdict sentencing to death 720 people in one day. But I believe things are more complex – and more simple at the same time. Like my police officer neighbor, I believe the judge to be a decent man. Honest, upright, and hard working. He must have sat pondering the case for hours yesterday. He believes he is protecting the country, defending basic rights, passing out heavy verdicts to people who deserve it. The country is in turmoil, he must be thinking. We have to stop this. We have to defend our nation. We have to send a strong signal that we are serious, that we are not joking. The stability of the regime and of the whole country is at stake. No compromises. No mid-way solutions. Hanging is the only deterrence, and we should not hesitate in resorting to it. Like my neighbor, however, this judge, even if I give him the benefit of the doubt (and I have bent over backwards to do so), is in fact undermining the stability of the country while thinking that he is doing the opposite. He may be thinking that he is sending a clear message that the Egyptian state is not to be tampered with, that it will hit back hard and swiftly at those who dare to violate its sanctity. But the only thing he actually managed to accomplish is to erode whatever faith people still have in the judiciary. How can anyone now believe in an dependent judiciary when one judge passes these draconian verdicts with such speed in complete disregard to the most basic rules of justice? These verdicts were passed without even allowing the lawyers to present their cases, and instead of pretending to do so, he actually fined them and charged them of contempt of court. Instead of being investigated or suspended, this judge is still sitting on the bench and passing one notorious verdict after another. This is not only a travesty of justice. It is not a violation of basic legal and constitutional rights. It is a very reckless and dangerous political move. If there is a sure way to bring down the Egyptian state, it is not by attacking police stations or throwing Molotov cocktails at the presidential palace. It is by making sure that people lose whatever respect and confidence they still have in one of the main pillars of the regime, namely the judiciary. More than any one else, this judge has had a huge contribution in undermining the stability of the Egyptian state. Khaled Fahmy is a professor and the chairman of the History department at the American University in Cairo. He studied Modern History at the University of Oxford and previously taught at New York University. This article was provided to Egyptian Streets by Aswat Masriya. This must not happen it will most definitely have negative repercussions for Egypt. many of us love egypt and we want to keep visiting and keep brining people but if this happens It will damage the face of Egypt for a very long time.